Technology improves at a rapid pace and the devices we love today are the outdated clunkers of tomorrow. Who’s got a VCR sitting around? I do. And although you may have a plan to replace, donate, or properly dispose of unwanted hardware, you still might have a pile of cables on hand. Fortunately, this often-overlooked pile of clutter is easy to handle. Start by making sure your friends and family all have what they need too. Perhaps they need extras for car charging or computer bags or whatever. I will add schools and scouting groups to the list of possible cable donation recipients. Many have STEM programs that are always in need of donations, and the cables they need often aren’t the latest and greatest. Other suggestions: Be sure you know your devices well to know exactly which cables you need for your devices. 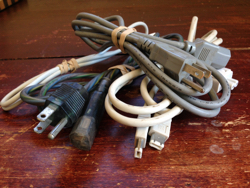 When you donate or recycle your equipment, include the appropriate cables with the device in your donation — especially duplicates. Also, check with your local municipal and/or county recycling centers to learn where to dispose of the cables so when it is appropriate to trash them (such as broken and unsafe cables) you know the location to drop them off and the process. Cables are insidious things that love to congregate in homes and never leave. The good news is there are several options for finding them a new place to be. Happy organizing! The photograph to the right was taken in 2010 at a client’s home. We called this, “The Scary Cupboard,” and it was in a damp basement laundry room. The constant moisture in the air reacted with the containers. The moisture eventually penetrated and softened the Sani-Flush container and then it started reacting with the Sani-Flush itself. We weren’t really sure what had been in the white plastic container next to the Sani-Flush, but the plastic bottle had degraded so badly that the contents leaked all over the bottom of the cupboard and started dissolving the wood and the other containers. The rust cylinder with the orange cap was a spray can of Static Guard. It collapsed and turned to powder when I touched it. I donned my personal protective equipment and placed all of the contents into bins destined for the household hazardous waste depot. The homeowners were very lucky because there was only some damage to the cupboard. There was the potential for some very dangerous toxic fumes and the heat buildup from the reactions could have started a fire and injured the homeowners. Before you purchase a product think about what you already have in your home that could do the job. Baking soda makes an effective scouring powder and vinegar can remove hard water stains. If these products will work, you don’t need to buy anything more caustic. If you only need to use a small amount of a cleaning product, for example a little bit of silver polish to shine a piece of jewellery, you may be able to find a jewellery store that would do the cleaning for a very small fee. You could also ask friends or neighbours if they have a bit of silver polish to spare. If you do need to purchase a specific product, only purchase the amount you will use in a reasonable period of time. Read the label and be sure you understand and follow the directions on how to use the product safely, how to protect yourself when using it, and how to properly store it. If you have any doubts about proper usage or storage, do a bit of research on the product to learn more. The manufacturer’s contact information always is on the label if more information is needed. When using the products in your home, always leave the product in its original container. Empty soda bottles and margarine tubs may not be capable of storing certain hazardous chemicals. Also, there is always the danger that someone may mistake that bright blue cleaning solution for Gatorade! Do not cover up or remove the labels from chemical products. Never mix products together unless it specifically states on the label that it is safe to do so. When diluting a product with water, always fill the container with water first, and then add the product. If you add the water to the chemical, it may create heat and melt the container or cause injury. Even mixing different brands of the same product can cause reactions, as the formulations may be different. It is not a good idea to store hazardous chemicals near food or food products because pots, pans, and cooking utensils can become easily contaminated with a hazardous substance. Consider storing items in a hallway closet or locked cabinet elsewhere in the home rather than under the kitchen sink, which is a damp area. Dampness can cause metal containers to rust and explode. 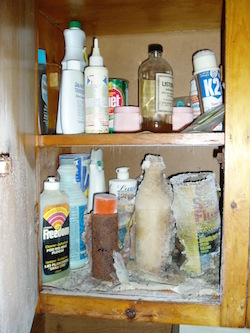 Ideally you should not store materials or chemicals on shelves above shoulder height. However, if you have no other storage area, always get a ladder to access these items. Remember, do not store liquids on shelves above powders or solids in case of leakage. Do not stack containers. Avoid storing flammable goods or products inside your home that have the potential to release harmful fumes. These items include paints, solvents, gasoline, fuels, and varnishes. Store them in a separate building or in an area that is well vented to the outside. If you have a swimming pool, be sure your storage area for the pool’s chemicals is well ventilated. Vapours may build up inside containers in high temperatures. On opening, these vapours may be expelled directly in your face, causing eye and mucous tissue injury. Pool chemicals should not be stored near paint, lawn care products, gasoline, solvents, or flammable materials. You may wish to relocate your gas-powered lawn mower from your garden shed to your garage. See the EPA website for more details on pool chemical safety. Some chemical products actually taste sweet and can be very attractive to pets and small children, so do not leave chemical products unattended. If you must leave the room in the middle of a task, either put the products away or take them with you. It is handy to carry products in a bucket — or two buckets if the products are incompatible. Know how to properly dispose of chemical products. If you don’t know how to dispose of the products, contact your local waste management authority. Hazardous household chemicals should never be discarded on the ground or poured into storm drains. Place empty containers in the recycling or trash in accordance with the regulations in your municipality. If they are partly full, consult your local waste management authority for advice. Also remember to never incinerate or puncture pressurized containers (spray cans). Finally, when storing chemicals, have all containers facing the same direction (such as the front of a shelf) so it is easy to read labels and identify products. Introduced at the 24th National Association of Profesional Organizers’ annual conference, are new paper sorting and filing products to help you keep your paper mess under control. Are you backing up all your critical files? Some backup tools will back up everything on your computer. Others won’t backup your software programs (Microsoft Office, Evernote, TurboTax, etc. ), assuming you can simply reinstall those. Some may depend on you to list exactly which files you want to back up. And you may use an entirely manual process rather than a program, which also means you need to determine the files you include in your backup. Do your backup programs fit your needs? Make sure at least one backup program runs automatically. Everyone’s busy, and almost everyone is a bit lazy about backups. Having a program that runs automatically can save you from yourself. Make sure at least one program creates an offsite backup. That usually means using a cloud backup service, but it could also involve taking a backup drive and putting it in a safe deposit box. This will protect you if there’s a theft, a fire, or some other tragedy that could affect everything in your home. Make sure at least one program saves files you’ve deleted from your computer as well as older versions of files you still have. If your only backup is one that mirrors your computer as it is at the time of the last backup, you’ll be in trouble if you delete a file by mistake, make an update you didn’t want to make, or wind up with a corrupted file because of a hardware problem. If having a new or repaired computer fully functional as quickly as possible is critical to you, look for a program that will create a bootable external backup drive. This means you can start your computer using an external hard drive as the data source, rather than your computer’s internal hard drive. SuperDuper and Carbon Copy Cloner are two alternatives for those using Macs, and I’ve been very happy with SuperDuper. I’m not as familiar with what’s available for those using PCs. Do you check your backup status messages? Programs will handle this differently, but all will provide some status indicator. For my cloud backup service, for example, I get daily emails. It’s easy to overlook these repetitive messages, but don’t do that. Take the time to make sure they aren’t alerting you to a problem. Have you tested your backups? While restoring all files for testing purposes is usually not practical, you can certainly try restoring a file or two and making sure things look okay. I knew someone who had to restore a great many files, and had never tested her backups until that time. Sadly, she found that while that files got restored, the date stamp on the files was not correct, which caused her numerous problems. If you’re creating a bootable external backup drive, try booting from that drive and making sure everything seems to work okay. Do you have the license keys and/or serial numbers for all your software? In order to get your software programs reinstalled or to get them running again after you’ve restored them from a backup, you’re likely to need your license information. Do you have that information readily available? If not, gather it up now so you don’t need to scramble around for it when there’s a problem. How is the Loose Leaf a unitasker? If you have two hands and have enough grip strength to use the Loose Leaf, you have no need for the Loose Leaf. The device and the simple trick pretty much employ the same concept, except one requires you to spend money on the special tool pictured above, waste time and energy using and cleaning it, and then sacrifice some of your space to store it … and the other doesn’t. That’s it, easy peasy! 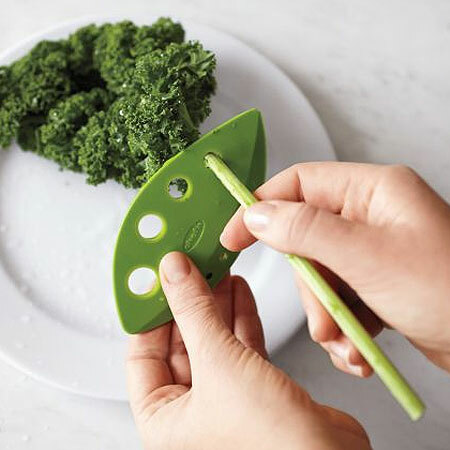 No knife or Loose Leaf needed to de-stem the kale and nothing to buy, clean, or store. Woo hoo, hands! Thanks to reader Amy for bringing this unitasker to our attention. Even as a frugal New Englander, I recognize when it’s time to spend some money on my organizing and uncluttering efforts. Let me preface this by explaining that my definition of frugal doesn’t simply mean cheap. To me, frugal means very little is wasted. Using the cheese rind in soup is the kind of practice I’m referencing. Old t-shirts become dust rags and empty jelly jars are perfect for storing hardware in the garage. Of course, this applies to money, too. I’ve shared plenty of DIY tips here on Unclutterer and I love them. There’s nothing a little Sugru can’t keep running. But occasionally, a paid solution is necessary. 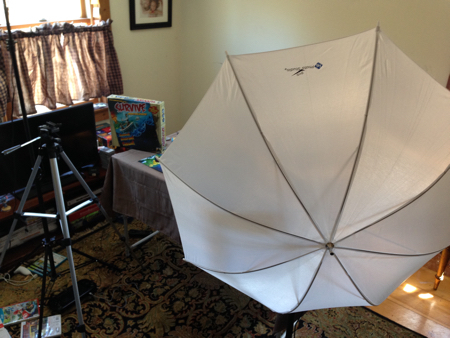 A recent personal example of this is the video studio I’m setting up at home, which requires spending some cash. When I’m not blogging at Unclutterer, I work as a writer at Apple World Today, a site for and by fans of Apple’s products and services. In addition to writing articles, I produce videos. I want the videos to have a professional look, so I purchased a green screen/lighting rig from Amazon. It wasn’t until it arrived that I realized just how big it is. We live in a small house that pretty much contains all it can neatly and efficiently hold, and this screen doesn’t fit. I first tried setting it up in our master bedroom, the largest room in our home. There’s a good bit of open carpet between our bed and the TV (an area that is where the kids play video games). When I set everything up in this space, I quickly realized that the video production rig commandeers that whole side of the room. “No problem,” Frugal Dave said. “I’ll just set it up and break it down as needed.” Oh, Frugal Dave. You fool. It’s three months later and I either leave it up — making the TV and video games inaccessible — or break it down after each use — which greatly increases production time. Alas, I needed a more organized, time-saving, and practical solution. My thoughts turned to our basement. Part of our basement houses random boxes, holiday decorations, and so on. My new, more organized thoughts are that I could use this underground space as my new studio. I’ll clear it out and spend a bit of cash to paint the walls, install a door, and install electrical outlets. These three things won’t cost me a lot, either in time or money, but the results will be fantastic. I’ll have a dedicated studio space, I can leave everything up without inconveniencing anyone and since it’s for my business, the expenses can be noted on next year’s taxes. Being frugal and living without much stuff doesn’t mean you never spend money or that every solution has to be recycled. Sometimes, spending money and effort can help you to be more organized and comfortable in your space. This isn’t to say you have to buy every organizing solution, either. Perhaps the utensil drawer would benefit from an in-drawer organizer you find online or a set of cubbies will help the kids put their school stuff away neatly. I’m all for frugal living, believe me, but sometimes you’ve got to spend a little to gain a lot. Many businesses employ a “just-in-time” (JIT) production method. In the JIT strategy, supplies are ordered just in time for production so items are manufactured just in time for shipping them to the customer. The reason this system is popular is because factories do not have the expenses of maintaining large warehouses. Using funds to purchase and store unused inventory means those funds are not easily available for other opportunities. Care must be taken when manufacturers employ the JIT method. If not enough stock is stored then deliveries, and associated delivery charges, increase. Also, the variations of cost prices can affect manufacturers to a greater degree. A number of years ago when I realized that I had toilet paper stored in every closet and cupboard (when I counted them, I had over 200 rolls), and I always seemed to run out of shampoo, I realized that I had to start employing the JIT method for my household supplies. Estimate how long it takes to use up the item. To help you estimate, when you open a package, write the date on the lid or underside of the box or bottle with a permanent marker. When you have used up the item, you’ll see the date and get a fairly accurate estimate. For example, depending on your household, you may use 1-2 rolls of toilet paper per week per bathroom. A 250mL (8oz) bottle of shampoo may last a month. It might take 3 months to use up 500m (500yds) of plastic wrap. Consider seasonal and situational changes as well in your estimations. You might use more plastic wrap during the school year when you are making children’s lunches. You might use less shampoo after you get your hair cut. Estimate repurchasing time. The time it takes to purchase replacement items may not be an issue if you can easily pick the items up during your weekly grocery shopping. However, if you purchase items from a specialty store that you visit infrequently or order items online and have them delivered, you may need to plan well in advance. For example, our family loves Kraft Caesar salad dressing from Canada. It takes us about two months to use up a bottle. We have an open bottle in the fridge and we store one extra bottle in the cupboard. As soon as I open the bottle from the cupboard, I order another one because it takes about 3-4 weeks to ship from Canada to the UK. Allocate storage space. The storage space that you have will determine the amount of product that you purchase and how frequently you need to repurchase. You may determine that you don’t need to store as much as of some items as you thought. (I really didn’t need 200 rolls of toilet paper!) This may allow you to free up some space to store other items that take more time and energy to purchase. For example, storing an extra bottle of your favourite salon shampoo would result in fewer trips across town to the factory outlet. Hone your forecasting methods. It isn’t always easy balancing how much of certain items you need with the storage space that you have. Certain changes can affect your forecasting such as changes in household routines as well as changes in the products, such as package size and price. If you keep the JIT method in mind, over time you’ll determine what is right for your needs. Reader Heather wants to know what to do with transient items while they’re waiting to be delivered or retrieved. I recently began a new job. My boss has been with this organization since the mid-1980s, and there is still paper lingering around from the 1980s, 1990s, and 2000s. She is hesitant to discard anything. She currently has three workspaces in the office, plus additional boxes and cabinets around the space that are organized but seem like they should be discarded. My coworkers have reported that she gets very upset when this topic is brought up. We will likely need some of this space in the future, and waiting for her retirement doesn’t seem like a proactive option. How might I address this with her in a productive manner? Reader, it sounds like this situation is very aggravating to you. However, unless the clutter is causing a safety problem or seriously interfering with your productivity, I’d suggest you do absolutely nothing right now. You’re new to the office, and your boss is known to be sensitive about this subject. It doesn’t sound like an issue you’d want to broach until you’ve been there awhile and have proven your value to your boss. And even then, I’d urge caution. People have varying styles of organization and comfort levels with letting go of things, and trying to get your boss to change her ways might not be easy or appreciated. You may be treading into emotional territory that you know nothing about. Ignoring the situation isn’t being proactive, but this may not be your problem to solve. Address the organization’s record retention policy. Is there one? If not, should there be? Does the organization have an attorney who could explain why such a policy is useful and clarify which records need to be retained? Address the space concerns. If more space is indeed needed in the future, should some of those records be stored offsite if she feels they must be retained? How much would that cost? Is it worth the cost? Address your boss’s frustrations. Is there anything about the current situation that causes her distress? If so, you might make suggestions that focus on alleviating her issues. Use outside experts. If an opportunity presents itself, you might suggest using an attorney (as noted above) or a professional organizer. An uninvolved third party with relevant expertise can often raise issues and make recommendations more effectively than someone within the organization. Thank you, reader, for submitting your question to Unclutterer. Do you have a question relating to organizing, cleaning, home and office projects, productivity, or any problems you think the Unclutterer team could help you solve? To submit your questions to Ask Unclutterer, go to our contact page and type your question in the content field or put your inquiry in the comments to a post. If you send an email, please list the subject of your e-mail as “Ask Unclutterer.” If you feel comfortable sharing images of the spaces that trouble you, let us know about them. The more information we have about your specific issue, the better. 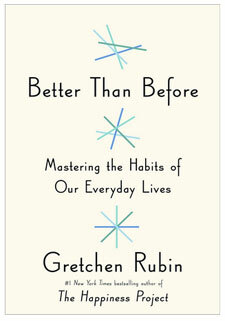 It’s rare that I come across a book and think, “every Unclutterer reader could benefit from reading this book.” But Gretchen Rubin’s latest book Better Than Before: Mastering the Habits of Our Everyday Lives falls into that exclusive category. 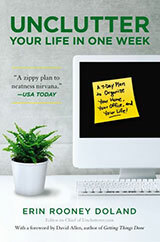 As the title suggests, this book is about creating beneficial life-long habits. The book doesn’t prescribe which habits a person should create, rather it’s a comprehensive exploration of HOW to make lasting habits that YOU want to make. 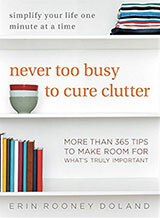 If you want to be more productive, manage your time better, stay current with household chores, live in an organized manner, have better follow through, or any of the other “Essential Seven” changes like exercise regularly or eat and drink more healthfully, this book can help you to make that happen. When possible, the brain makes a behavior into a habit, which saves effort and therefore gives us more capacity to deal with complex, novel, or urgent matters. Habits mean we don’t strain ourselves to make decisions, weigh choices, dole out rewards, or prod ourselves to begin. Life becomes simpler, and many daily hassles vanish. So, once you have clarity of what you wish to do and what habits you wish to incorporate to reflect your identity, you can set forth on your habit creations and life changes. She believes there are four Pillars of Habits: Monitoring, Foundation, Scheduling, and Accountability. You’ve likely encountered these concepts before in terms of goal setting — you need to be able to monitor (in a quantifiable way) the process and outcomes, you need to begin with a foundation of changes that will produce results quickly and in a rewarding way, you need to schedule when the habits will take place, and then have a way to be accountable for your changes. Rubin provides varying types of strategies in each of these Pillars based on your tendency type. Next, she addresses how to begin the new habits. And then, what I see as the most valuable part of the book, Rubin explores the most common ways people fail at sustaining good habits and how to overcome those problems based on their tendencies. In the chapter “Desire, Ease, and Excuses,” I was most drawn to the sections on Safeguards and Loophole-Spotting. Safeguards, at least as I interpreted them, are plans you create in advance for when you expect to fail or when you will make exceptions to your habits. It’s knowing yourself well enough to predict how you will fall off the proverbial wagon and then plan what you will do about it when it happens. They’re backup plans formulated in the If-Then method: “If _____ happens, then I will do _____.” For example, I abstain from eating doughnuts — I’m not a huge fan of them and they’re not a healthful food choice. However, based on experience, I know there is one situation where I have virtually no self-control when it comes to consuming them. Therefore, I have a safeguard in place for when I find myself in that specific tempting situation. “If someone offers me a doughnut, then I will eat one ONLY if I am standing in a doughnut shop and the doughnut is hot and fresh off the production line.” I am a person who doesn’t eat doughnuts except in that specific situation, and since I am rarely in that situation, I at least know how I will handle myself if/when I encounter it. In 10 years, I have only encountered that situation twice. By catching ourselves in the act of invoking a loophole, we give ourselves an opportunity to reject it, and stick to the habits that we want to foster. I personally found this book to be incredibly helpful. If you want to make changes in your life through the adoption of positive habits, I strongly recommend Gretchen Rubin’s latest book Better Than Before: Mastering the Habits of Our Everyday Lives. Again, I truly believe all unclutterers could benefit from the research and analysis contained in it. Establishing uncluttering and organizing habits can simplify one’s life, and Rubin’s methods can show you how to do this effectively. 3-D printing: For better or for worse? While they’re not quite as cool as Transformers, I think you’ll agree that reversible belts are much cooler than Gobots. Since tax time is a little less than a month away, I wanted to nudge everyone to get their papers filed if you haven’t already done so. Especially if the government owes you money, it’s good to get this chore marked off your to-do list earlier than later. The people in Switzerland are brilliant.